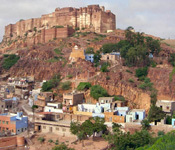 Rajasthan is one of the most visited destinations in the country. It is well connected with major means of transport from all parts of India. The state itself has a wide network of public transport as bus for getting around in Rajasthan. Jeeps can also be hired. Before hiring a jeep, it is best to finalize charges as jeep drivers tend to charge higher than the going rate. Many private travel agencies also offer organized trips to this state but they are exorbitantly priced. A chauffer driven car can be hired, for instance, from International Airport, Delhi to Neemrana Fort costing about 4000 bucks for five passengers. Luxury buses also run from Delhi to Rajasthan and these buses are operated by Tourism Department, Government of Rajasthan. This bus service is available for limited cities in this state. Another mode of travel which is not only efficient but also affordable is train services. Many trains depart from Sarai Rohilla Station for Rajasthan. Since, this destination is not too far away from Delhi, road trip can also be enjoyed. It is fun to watch landscape changing as one move from Delhi to Rajasthan. Roads are not too good but perfect for short drive. Drive from Jodhpur towards Jaisalmer is quite interesting. Local transport is available without any problem. Major flights between main cities and Rajasthan are operated by Indian Airlines. It is the Government run major airlines of the country. Many private operators also operate their flights to and from Rajasthan. The only international airport in Rajasthan is situated in Jaipur, its capital city. Right now, only one International flight between Jaipur and Dubai is operational. Tourists coming to Rajasthan from foreign countries reach here via Mumbai or Delhi. 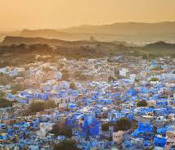 For bulk of the tourists, Delhi is the closest and most convenient destination to visit Rajasthan. Distance between International Airport in Delhi and Jaipur is just 260 km. Many modes of transportation are available for this stretch. Mumbai is another alternative for foreign tourists coming to Rajasthan. There are three domestic airports in this state- Jaipur, Udaipur and Jodhpur. Daily services are available through flights operating between these cities and Delhi and Mumbai. A well connected railway network makes travelling comfortable and convenient to this state. The railways stations are well managed. There are several trains from Mumbai, New Delhi, Kolkata and other main cities to various cities of Rajasthan almost daily. 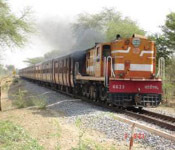 There is a well established railway network within Rajasthan that helps in visiting various cities without any trouble. If one wishes to experience true splendor of Rajasthan, the best way to do so is by travelling on “Palace on Wheels”, a popular luxury train. Road transportation in Rajasthan is well developed. National Highways network and State Highways network criss-crosses through the state covering almost entire region. Smooth roads between Delhi and Jaipur makes drive comfortable and enjoyable. It takes hardly five hours to reach Jaipur from Delhi. Many tourist buses as well as private cabs ply between these cities. Many RTDC buses are also available. They start from Bikaner House in New Delhi. Scheduled bus services are also available between major Indian cities and Rajasthan like Aurangabad, Chandigarh, Agra and Ahmedabad. Many people bring their cars and bikes to India and prefer them for exploring this amazing country. Cars are also available on rent in case if one wishes to travel on his own. If one would like to visit interiors, hiring a motorbike would be best idea. Taxis are readily available in most cities and towns of Rajasthan. Mostly, these taxis are metered. In Rajasthan, one can also enjoy a cycle rickshaw ride. For covering short distances, these are most convenient besides being affordable. An auto rickshaw with a driver in front and seating for two passengers is another way of commuting in this state. Tempo can be considered as an extension of an auto rickshaw. Operated like minibuses, these are three-wheeled vehicles. In small towns, tongas are available. These are basically carriages driven by horses. One can hire bicycle on rent and explore a city or town at leisure. For this purpose, one must be physically sturdy so that long distances can be covered without any trouble. Several intra-state and inter-state buses are also available. 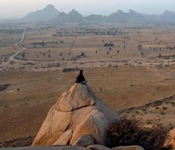 In many rural areas, jeeps are available for exploring interior areas in Rajasthan. These are basically open jeeps. Services are available in several cities. Excellent view can be enjoyed while travelling through Jeep cantors. 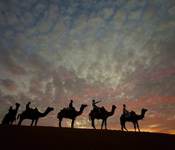 In desert regions and rural towns, camel carts are available. Commuting becomes quite easy with this mode of transport especially in deserts. These are basically used for transporting goods from one destination to another.